Adventure noun: 1. an exciting or unusual experience. 2. a bold, usually risky undertaking; hazardous action of uncertain outcome. In the past couple of weeks for better or worse we are having an adventure. A hazardous action of uncertain outcome. I should have looked up the definition of adventure before we left home! The day the gymnastics gym in Granada opened, September 2, we eagerly set off to explore the possibility of joining their team. Sky and Savvy packed their favorite leotards, excited to meet the new coaches and gymnasts. We found the gym in Granada hours before they opened but we were anxious to just see where it was so we parked and walked in. It was in a sports center that is part of the Universidad de Granada. We took note of the location so we would arrive back before the first practice was to begin. We thought we would explore the area to see if we might find a location to live closer to the gym. The road to Granada was mostly freeway but there is a treacherous section of winding road that we didn’t think we wanted to navigate at night several times a week. Mike had studied google maps and knew that there was an area to the north of Granada that looked promising. We drove into a little town called Alcafar that sits on the edge of a mountain. It happens to be the presumed burial place of Frederico Garcia Lorca, the famous writer. We ate at a hotel on the outskirts of town. It was Savvy’s best meal in Spain. She ordered “pechuga de ave” ,chicken breast with rice, and was very happy. Sky on the other hand was upset by all of the hanging legs of jamon behind the bar. Bad enough that the feet are still attached but they are partially carved showing the insides of the muscles. After lunch we drove up toward the hills. Alfacar is a more upscale town than Alhama and Mike pointed out that we might find a place with a dishwasher and a clothes dryer if we were to move here! Savannah spotted one of the many parks that are painted the colors of the Spanish flag. Red and yellow exercise equipment spread out under pine trees inviting us to play. The Spanish government, in an effort to interest the citizens in exercise, has placed one of these parks in every town that we have visited. We haven’t seen anyone using any of the parks, however. Savvy had been wanting to try it out and in her excitement to get out of the car she somehow shut her finger in the door. 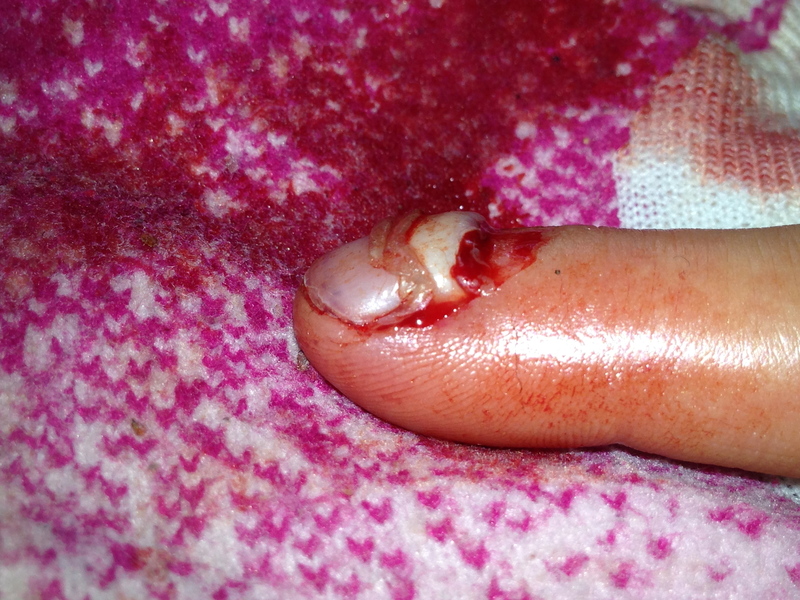 She shrieked, “I think I cut my finger off”. My stomach sank, I ran to the other side of the car. She was screaming and blood was pouring from her finger. I was relieved to see that she still had 10 fingers. The pointer finger on her right hand was badly smashed from the base of the nail. Mike absolutely insisted that I post this picture. My apologies if it bothers anyone! Sky spotted a water fountain and we rinsed it off. For lack of anything else to wrap it in I wrapped my sock around it and held pressure. Savannah sobbed and I struggled to hold myself together. It is such a different thing when the injured is your own child. I can calmly do surgery on patients but there is so much more emotion attached when one of the people you love most in the world is hurt. 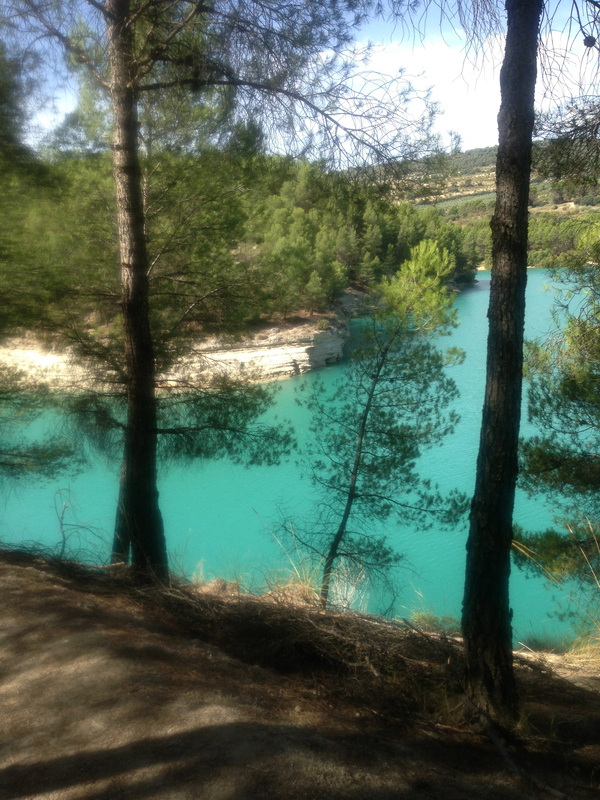 We got back in the car and drove to the main part of Alfacar. It was siesta time (2-5pm) so everything including the medical clinic was closed. We found a pharmacy, again closed. There was a note on the door of the pharmacy that said en caso de emergencia toque el timbre. We rang the bell and Mike calmly explained into the intercom in Spanish what had happened. The pharmacist was very kind and came right down to let us in. She pulled together all of the supplies that we needed. Savvy was still crying loudly. The woman looked relieved when we told her that we were doctors and would try to take care of it ourselves. She lead us to her restroom. We would have used some lidocaine but that was not available so dear Savvy bit a balled up shirt and screamed into Mike’s chest while I cleaned and dressed her wound. She kept saying, “why can’t we just go back in time?” I knew the feeling. Once bandaged the pharmacist gave both girls cherry suckers and everyone felt a bit better. We thought about just heading back to Alhama de Granada but Savvy agreed to check out the gymnastics gym after all. We were all disappointed to find that the team wasn’t really gymnastics as we think of it. Our gymnastics that includes bars, beam, vault and floor is called gimnastica artistica. This team is gimnastica acrobatica. It is really just tumbling and tricks with parters on the floor, think Circ de Soleil. This was a disappointment for all of us. Savvy’s hand was too painful to think of doing anything and Sky was feeling shy. The girls on the team were obviously very strong. They all wore little shorts over their leotards (not allowed back home at Technique). It was just too embarrassing for Sky to change into a leotard alone so we left. On the positive side the coaches were very nice but also very serious about their sport. We told them we would come back when Savannah had recovered. We drove home, all of us upset and stressed from the trip. Savannah will have 20 children in her class and Sky will have 10. Neither teacher speaks any English although the school has a sign posted at the entry that says Centro Bilingue. We smiled after hearing that Sky’s teacher is called Paco. Her favorite doll when she was a toddler was called Paco, likely Adelina’s influence :). She loved Paco and carried him everywhere. Must be a good omen! After a tour from Javier we sat in his office and filled out all of the registration forms. They were happy that we had brought all of the vaccination records and didn’t seem to mind that it was all in English. The school feels very laid back and not stressful which was a big relief. After our visit the girls felt much more comfortable about the prospect of starting school the following week. 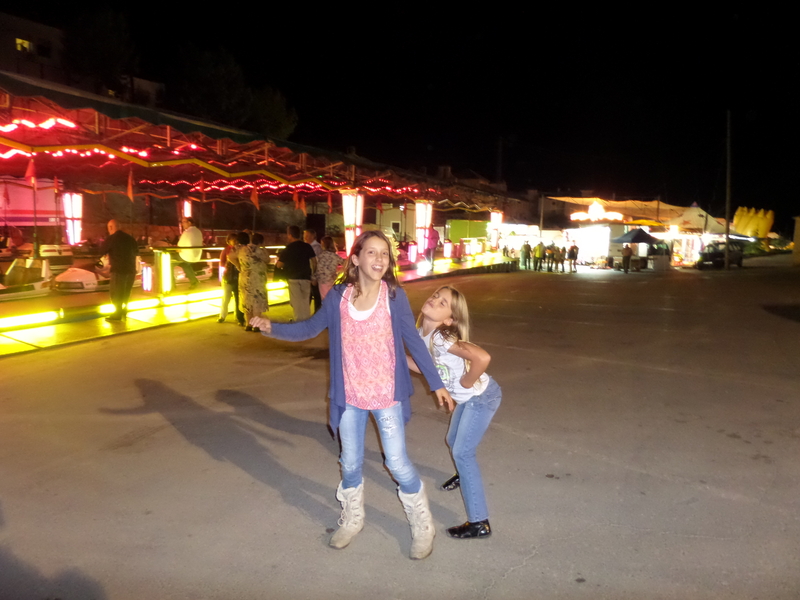 Before the school year starts each year Alhama has a 4 day feria to mark the end of summer. During this time many stores and businesses are closed with signs on the doors that say, “Regressamos Lunes, estamos en la Feria” . There are futbol and volleyball games and celebrations of all sorts. There is a carnival each night. The first day we walked down to the fair grounds. Like carnivals everywhere it had a very seedy feel. There were dirty men setting up dangerous looking rides. I asked one what time the fair would start. He said “when the people come”. I asked when that might be. He grunted at me and replied around 11pm. The girls were excited to return. Our schedule here is so odd. It is unheard of to eat dinner before 9 and most of the fair activities occur after midnight. Surely the businesses are closed during the day so that people can sleep! Since school hasn’t started we have let Sky and Savvy have a very relaxed Spanish schedule. We have been sleeping until 9 or 10 AM on the days that we can manage to get back to sleep after the convent bells ring at 8:30, 8:45 and 9:00 AM. Bedtime is usually around midnight but we all planned to stay up later for the fair. 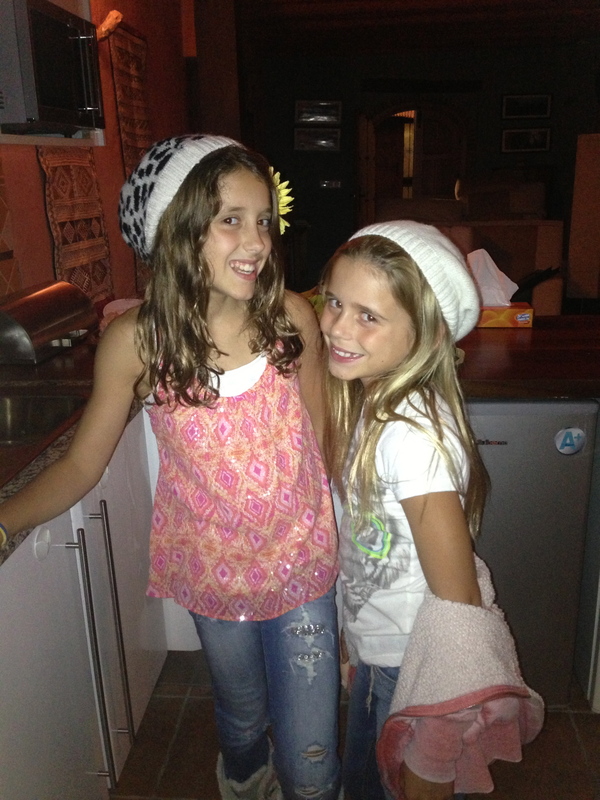 The girls dressed in jeans from Abercrombie and Justice, cool tops and jaunty hats. Beautiful girls, off to the fair! 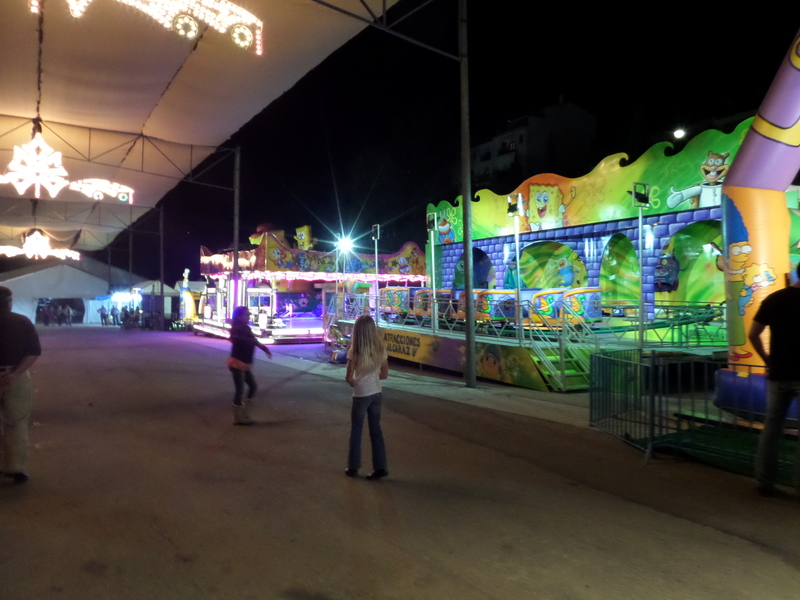 We walked down the hill to the fair at 10 PM and were nearly the first people there. We walked down from our house and were followed by a trickle of other carnival goers to the fairground. The little girls were dressed in traditional frilly dresses and I noticed Sky and Savvy glanced down at their carefully selected outfits. I assured them that the older kids would be wearing jeans, luckily I was right. The first ride was a loud bumper car ride. There were bright lights and loud music. The man in the booth was hunched over the money, a dirty troll. He collected our 2.5 Euros each and gave us dirty plastic tokens. The troll’s partner was a thin, jittery, filthy man. He leaped from car to car with a cigarette hanging from his mouth. He arranged the children in the cars. Mike watched us climb into the bumper cars. There were no seat belts and I felt vulnerable as the other children pushed the gas pedal to the floor and plowed into us. 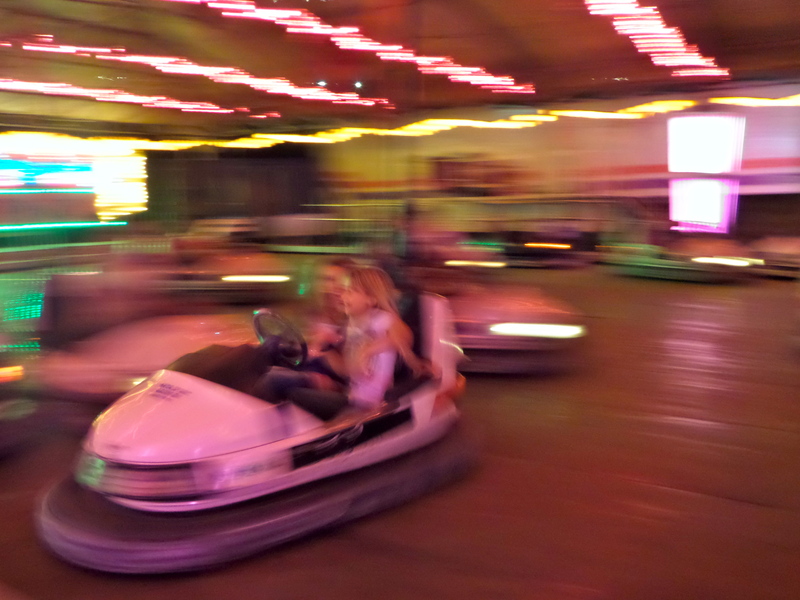 These were the fastest, least cushioned bumper cars I have ever been on and the ride went on and on. After several jolting collisions, I pulled over to the side and hopped out. The girls finished the ride and were energized to check out the rest of the fair. 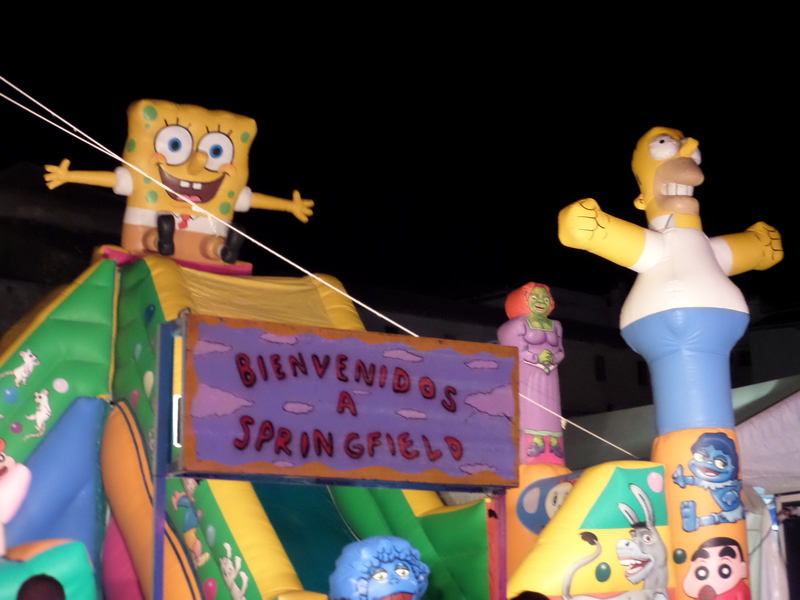 There were several bounce houses, shrines to Sponge Bob and Bart Simpson. I knew Savvy and Sky would have loved to practice their back handsprings, handstands and flips. Sky is a sweet sister and didn’t even mention going in the bounce houses because she knew her little sister’s finger was still really sore. We surveyed the rest of the rides. We decided that the rides were either for smaller children or looked too dangerous to consider. Mike spotted a Churro and Chocolate stand. We couldn’t pass that up . The man at the stand was busily finishing off a plate of churros. With a smile he explained that he had to make sure that they were good. We ordered 3 churros and some chocolate (thick hot chocolate). He invited us to sit under his tent. We were the only ones there so we sat and waited while he prepared the fresh churros. In a few minutes he walked over with an enormous spiral of fried dough. It was bigger than a pizza! We thought it was a mistake. I said, no, no, just 3 churros. 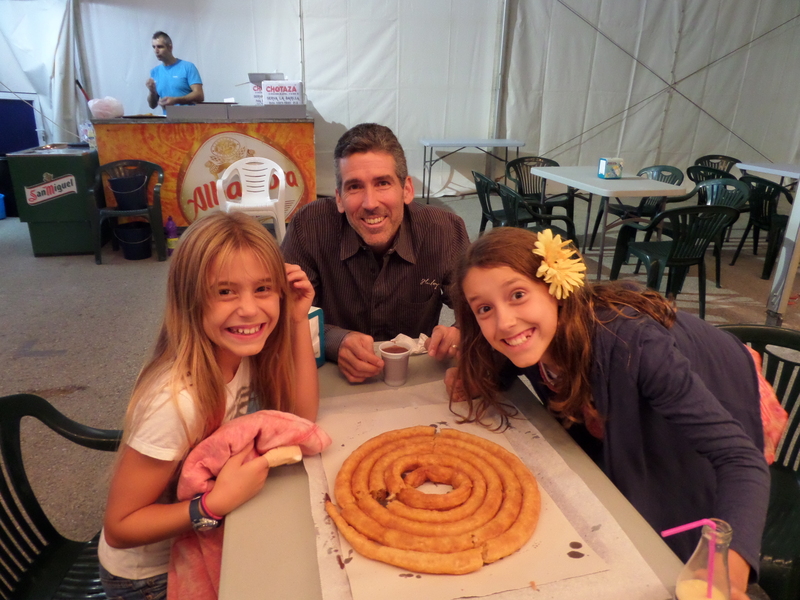 He laughed and said, “Si, Churros para 3″! Savannah points with a bandaged finger, Donut/Churro heaven! Mike and the girls were in donut heaven! We poured sugar over the hot churro and submerged chunks in cups of thick molten chocolate. Although it looked like “churros for 10” the 4 of us finished it off and licked our fingers. Mike and the girls found a candy stand next. They each picked out a treat. Mike choose a box of throwable “snap-caps”. The box was full of tiny pieces of paper wrapped around gun powder and salt crystals. He opened the box and delighted the girls by tossing a couple at their feet which made a loud snapping sound. The 3 delinquents thought they had a trick from Fred and George Wesley’s joke shop. Sky and Savannah each took a handful and ran around tossing them into little groups, startling people. Great family fun! Before we headed back up the hill the girls wanted to hit the bumper cars one more time. It was more crowded the second time and nearly every car was full. Sky and Savannah looked a little scared in their separate cars. The kids whizzed around banging into one another in their seat-belt-less cars. I spotted Sky crying in her car, Team Kezmoh’s second (and hopefully last) injury. She had been hit very hard from behind and the back of her head hit the hard metal headrest. I tried to yell at her to stay in her car. I was too late. She looked both ways, jumped out of her car, and ran to the edge of the ride out of the traffic. Thankfully she wasn’t hit by one of the cars! The skinny guy with the cigarette didn’t even look twice. Disney would be horrified! Sky ran around the outside of the ride to us. Savvy carefully steered her car to the edge and hopped out too. They are very sweet when the other is hurt. Sky felt well enough to walk/run home so I knew she was probably OK. I felt her head half way home and it had a golf ball sized goose egg. She complained that her entire head hurt which worried me. I started to feel really scared since we are an hour from Granada and there is really no medical care here in Alhama. Mike and I did several neuro exams on her, iced her bump, gave her tylenol and put her to bed. I checked on her several times in the night. By morning she still had a headache but after some tylenol she didn’t mention it again. At this point it’s been 3 weeks since the finger injury and we are still changing the dressing every 1-2 days. Savannah just brought herself to look at it yesterday. She is able to do handstands and play at the park but every once in awhile the tape comes loose and we have to hurry home to reapply a new dressing. We are curious to see when the nail will fall off. Stay tuned for more Team Kezmoh adventures. I’ll try to get another post out soon. We are moving this week so we have been very busy. More about that later! Please feel free to comment or to e-mail me at Lkezmoh@gmail.com Miss you all! Whoa..reading your adventures today was really like a roller coaster at that fair..I was glad to see smiling faces around the churro …Savvy and Sky are amazingly resilient. I hope there is some good new activity to offset the gymnastics loss..
Good that you guys are having an adventure. Doing the hard stuff together and getting through it together is the objective. One of my friends, Jared Campbell, wrote one time about conditioned optimism. He was training for the Barkley Marathons. The worse the conditions were in training the more prepared felt. Not that anyone looks forward to injury, but struggling through and being able to face looking at the smashed finger makes all of you stronger. Lots of love from Uncle Peter and the SLC crew. Nia & Lana felt real bad for Savannah, and hope her finger get’s better quickly.